And local officials made it worse when they opened a dam. As Ivette Ortiz sat in her home on Calle Pedro Albizu, she saw the water start to come through her second floor, about 10 feet from the ground. It rose faster than she had ever seen or imagined—swelling several feet in just a matter of minutes. But there was nowhere to go. She seriously considered, she recalls now, that she might die. Ruíz says that before Maria, this part of Toa Baja, while poorer than many communities, was thick with green, lush trees and stuffed with homes made from concrete and wood. Now, when you drive through the area, it seems that most every building is either missing its roof, has had its windows blown out or awnings ripped off, or it looks totally demolished. The water lines on the homes that do remain reach as high as 8 feet, and many are strewn with a mess of dried leaves and other organic material left behind by the murky brown water. Streets are lined with ruined cars and toppled electrical poles. 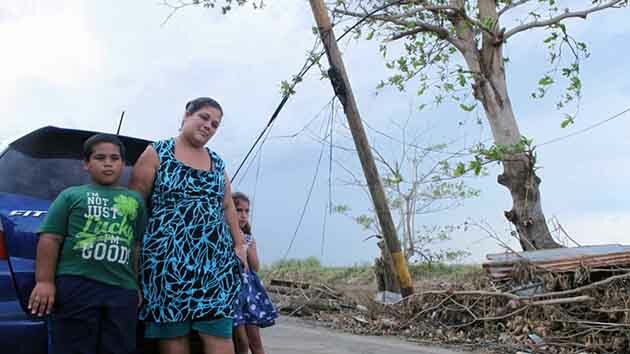 At one point, as I’m talking with one resident, Yanitca de Jesus, and her young children, Luis and Janice Ortiz, I notice that an electrical pole is leaning over and supported only by the wire and a small tree branch. “That looks dangerous,” I tell them. “It is,” de Jesus replies. In many ways, the stories people had to tell in Campanilla were similar to those from the day before in Ciales, a mountain town where many homes were either wiped from the earth or rendered uninhabitable, caked in mud, and gutted of everything that the families had inside. Like those in Cialies, residents in Campanilla tell me there’s been no meaningful government response since Maria struck—none from local, Puerto Rican, or federal authorities—despite the grim conditions, meager food supplies, and lack of running water. Residents haven’t seen any government officials come around to survey the damage or tell them what’s going to happen next. That’s not how Jaime Rivéra remembers the lead up to the flood. With dirt on his hands and shoes after days of trying to get thick, slick brown mud out of nearly everything in his yard and the first story of his house, Rivéra, with short, curly red hair and deeply tanned skin, tells us his understanding was that the town was supposed to sound a signal to let people know the water was coming. But, we ask, did the signal ever come? “Nada,” he says—nothing—holding the first cold beer he’s been able to drink since the storm, now that he was finally able to get fuel for his generator yesterday. Regardless of whether the warning was ever issued, ten days later, most people on Calle Pedro Albizu—a riverside street with nine houses at the edge of Campanilla—are mostly still waiting for any sort of government support. Most of the people we spoke to were outside on their balconies or in the front yards, which is where many people spend their time these days, on an island where 95 percent of the people have no electricity and 55 percent have no running water. Ortiz says the only government-sent official she’s seen is someone from the National Guard who came to her house, but just to tell her that he was going to request more people from the National Guard come to the area and offer supportive words. Rivéra tells us that we’re the first to come to ask him about the damage to his home, and Camacho says the same. But all three have seen military and Coast Guard helicopters fly back and forth over the area every day. As I’m talking to Ortiz, a Coast Guard helicopter, in fact, flies over. “Hey! We’re here!” Ortiz yells into the sky, waving her arms in a mocking way. Along with the toppled poles and lack of food and drinking water, the residents are also concerned that the floodwaters, even though they’ve almost completely receded, are essentially wastewater and are leaving behind a high risk of infection. With all the animals killed in the hurricane and the flood, plus the trash, human and animal waste that was mixed in as everything spilled into the street, the water everywhere looks like watered-down chocolate milk. One man who didn’t give his name said he got an infection from the floodwaters and had to go to the emergency room. “Now he’s got a $240 bill on top of everything,” Camacho says. This level of risk is inescapable. As we drove into the town, we noticed a dumping site for garbage and debris that the community has started because there’s nowhere else to put everything. Luis Ruíz, who was talking with us on Calle Pedro Albizu, tells us the debris pile, which occupies an area roughly the size of a football field, includes rotting meat and dead animals. It smells exactly how you think it would. The town’s problems even follow the dead. Edwin Falú owns and operates Funeraria Falú, a funeral home in Campanilla. He tells us that he runs the only funeral home in the area (there are two operating in nearby Levittown), and that he’s been busy. Luckily, he has his own water tower and his own generator, so he can keep operating, but diesel fuel costs double what it did before the storm. The biggest problem for him, though, is that the bodies he gets are already decomposing—something he’s never seen before. “The bodies are coming in green,” he tells us. He further explains to David Ruíz that part of the problem is that the refrigerators at the morgue at the hospital are not cold enough to keep the bodies from decomposing. Even still, back on Calle Pedro Albizu, there is some hope. Ortiz says her daughter is two months pregnant and can’t get the prenatal care that she needs, but, she says she assures her, things will be OK. The sad reality is that Ortiz has no choice but to keep moving forward. What else do you want to know about the crisis in Puerto Rico? AJ is taking your questions while he reports from the island. You can submit them here, and he’ll see what he can investigate for you.